MANILA - (UPDATED) President Rodrigo Duterte on Monday signed into law the proposed P3.7-trillion national budget, Senate President Vicente Sotto III said. In a phone interview with ABS-CBN News, Sotto said Duterte also vetoed a total of P95.3 billion in the budget, based on information from the Office of the President. The vetoed items include the P75 billion "insertions" applied by congressmen covering public works projects, Sotto added. Executive Secretary Salvador Medialdea also confirmed Duterte signed the national budget. In a statement, Presidential Spokesperson Salvador Panelo said Duterte vetoed items in the total amount of P95,374,241,000. "True to his commitment and constitutional duty to be fealty to the constitutional directives, the President vetoed items of appropriation that are either considered by law and jurisprudence as rider provisions not being related to a particular appropriation or they seek to amend the Constitution and certain statutes," he said. He also said Duterte subjected certain provisions of Republic Act No. 11260 or the General Appropriations Act for Fiscal Year 2019 to "conditional implementation" in accordance to existing laws, rules and regulations. "The President likewise subjected certain provisions to conditional implementation in order to ensure conformity with existing laws, rules and regulations, such as the allowance and benefits of teachers and creation of teaching positions, construction of evacuation centers, funding for foreign-assisted projects, revolving fund, and lump-sum appropriations for capital outlays, as well as financial assistance to local government units and funding requirements of our foreign service, among others," Panelo said. Panelo said copies of Duterte's communication to Congress will be furnished to members of the press once they are ready and available. Sen. Panfilo Lacson, who accused House leaders of "manipulating" the budget, said that while he has yet to see the items vetoed by Duterte, the removal of insertions was commendable. "I have to see the veto message first although I think it is safe to assume that at least most if not all of the P75 billion worth of items as listed by SP Sotto was part of the President's veto message. It is that, or the P20 billion plus insertions made by some senators was included as well," Lacson said in a statement. "Either way, it is [a] victory for the Filipino taxpayers. Having said that, I would like to personally commend the president and his economic managers for coming up with a "pork-free" national budget," Lacson added. Meanwhile, House Majority Leader Rep. Fredenil Castro said they respect the President's decision to veto some items in the budget. "We respect his decision to veto some items in the budget. We will abide with the President’s decision and respect the thorough study made by his team after all factors were considered," he said in a statement. "With the signing, we can all buckle down to work and start implementing the President's priority projects for the Filipino people. The House of Representatives will continue to work in harmony with the President’s desire to create a better life for every Filipino," Castro added. 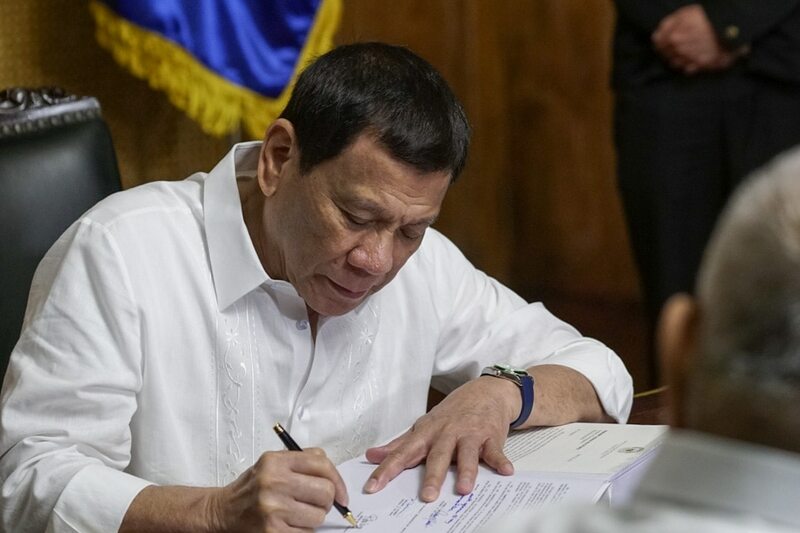 The President’s signing of the bill ended an almost four-month delay that threatened the growth of the economy and affected some government services and projects. Sotto had urged Duterte to veto "unconstitutional" provisions within the spending plan, including the alleged realignment of a P75-billion chunk of the proposal. The amount was earlier questioned by House members as an alleged insertion by former Budget Secretary and now Bangko Sentral Governor Benjamin Diokno into the proposed budget of the Department of Public Works and Highways, delaying deliberations. Prior to the signing of the budget, the government had operated on a reenacted 2018 budget since January.